Campus activity has slowed down during the summer break, but Dixie State University’s student-run food pantry is still up and running. 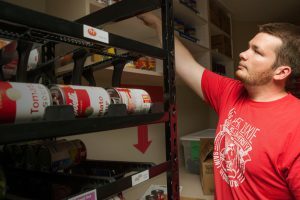 Maintained by the Service Branch of the DSU Student Association, the Campus Food Pantry is open business hours throughout the entire year so that it is available any time students need it, Dillon McKinney, DSUSA’s vice president of service, said. Thanks to a partnership with the Utah Food Bank, the pantry is re-supplied every month to supplement the short-term needs of students who are struggling to make ends meet. McKinney said the pantry is open to anyone on campus without any stipulations in place. Located on the second floor of the Gardner Student Center near the Student Association room, the pantry is unlocked so students can help themselves to what they need. A goal of the pantry is to help students lead healthy lifestyles and receive the proper nutrition they need to focus on their studies. McKinney said appreciation for the pantry has been widespread. In addition to the students who have thanked him, parents have similarly expressed their appreciation for the project while touring campus over the summer with their incoming students as part of freshman orientation. “When I make note about the pantry, parents give a sigh of relief and say, ‘I know my child will be taken care of and I don’t have to worry about them,’” he said, noting that with the university’s Health and Wellness Center, students have resources to take care of every sense of their well-being. The effort to supply the Campus Food Pantry has expanded beyond student government and become a campus-wide initiative. In fact, campus entities such as the Multicultural and Inclusion Center and the Business Department have held food drives of their own to support the pantry. Additionally, faculty and staff have taken it upon themselves to make donations, and students help stock the pantry by bringing nonperishable food items in exchange for admittance into certain student life events. The library has even donated can openers to ensure students have the means to take advantage of the available food and prepare meals for themselves. The student association is in the process of expanding the effort to add a second pantry in the university’s Russell C. Taylor Health Science Building. Located away from DSU’s main campus near Dixie Regional Medical Center, the building houses the university’s School of Health Sciences, and often times students studying there don’t make it to main campus. “We are trying to expand the pantry a bit and make it more accessible to a wider range of students,” McKinney said. To learn more about Dixie State University’s Campus Food Pantry, visit thedixielife.com.